Kim Cheung created WiseMachine, application to install software to remote computers in the network. * how to pass a distribution pack? = по какому протоколу работать? как передавать дистрибутив? только в локальной сети? * module: daemon on every eCS PC = На каждой eCS должен быть демон.. висит, ждет запроса от сервера, что надо что-то установить. * "Новое средство распределенной инсталляции (установки)"
* network-managed client/network manager tool called "WiseMachine." * eComStation features Wisemachine (TM), the industry's first implementation of Mobile Managed Client Technology. WiseMachine is new to most OS/2 users. It will take some time to get used to how it's organized and how you are supposed to use it. There is some documentation, but more needs to be written. WiseMachine is good at redeploying the applications it knows about. It's a simple drag and drop operation to redeploy an application. However, deploying an application is not the same as installing an application. When you deploy an application you are recreating the desktop objects and, possibly, updating config.sys entries. This is helpful if you have lost some desktop objects. However, it's only a subset of what needs to be done to install an application. WiseMachine can install some applications, but is still a work in progress for consistent operation. To install an application, you need to know if WiseMachine can install the application and you need to know which menu to use. Many of the applications you will want to install will be found under the Utilities -> Selective Install menus. A few applications can be installed from the left-hand Application window. When installing from the left-hand window, there is a problem with the "meat." This is WiseMachine's term for the actual application code. 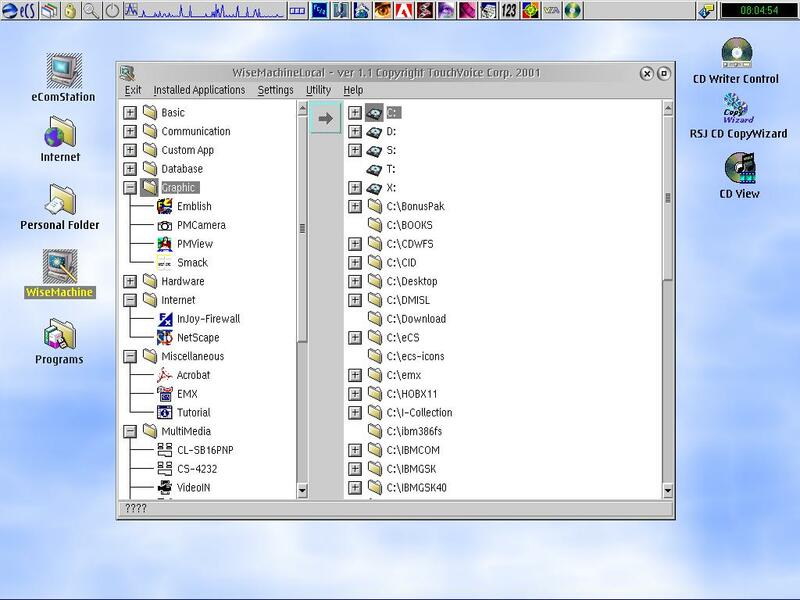 When you attempt to install an application from the Application window, WiseMachine will supply a default Source directory. This is where the "meat" is supposed to be. The default directory is rarely correct. You need to point WiseMachine at the "meat" which can be an adventure. Some meat is on the eCS CD's. Some you might have to provide yourself. None of this is fully documented. None of these issues are show stoppers. They just make WiseMachine more difficult to use, than need be. Mr. KIA is hopeful that, in the near future, Serenity will release a WiseMachine update that corrects this.